Bardia National Park is Smaller then Chitawan National Park but house the same exotic Animals and jungle environment of the Tarai. 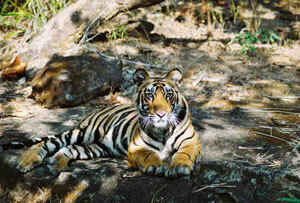 To reach the Royal Bardia national park, there are daily flights as well as Public buses from Kathamndu to Nepalganj. The park office situated 20 Km southwest allong the Highway. There is numerous of lodges and hotel resorts so there is no real problem for accommodation however there is more tourist in season time so better to have an advance booking before you departure. Bardia is more isolated then Chitawan that is the reason it has fewer resorts and fewer visitors. But this also adds to the excitement of exploring this jungle. All resorts are at the border of the national park and numerous jungle activities are possible. There are wide verities of jungle activities available in both parks. Elephant riders are the best way to explore the jungle and search for wildlife. Jeep safaris are also available for those who don't feel like riding atop an elephant others might enjoy a jungle walk with an experienced guide who can tell you all about the wildlife and vegetation that is unique to the Terai region. Day 01: On Your arrival at Nepalgunj Airport or Ambasa Stand, our staff will receive you. You will then be transferred to resort. On reaching resort, our Guest Relations Officer will brief guests. 3.00 p.m - Village tour to a nearby ethnic Tharu village where you will learn more about the life and lifestyle of the Tharus. 7.30 am - Elephant Safari. An excellent opportunity to see Asian Elephant, Great One Horn Rhinoceros, Spotted Deer or Chital, Hog Deer, Barking Deer, Samber, Swamp Deer or Barasingha, Nilgai or Bull, Black Buck, Wild Boar, Royal Bengal Tiger, Leopard, Wild Dog, Golden Jackal, Striped Hyena. You will also encounter many other smaller mammals that have made Bardia their home. 3.00 p.m. - Jungle walk. An excellent opportunity to see the wild animals, small mammals, birds and waits in the to have the wild sightseeing, accompanied by our experienced naturalists and wild life tracker. Excellent photographic opportunities are plentiful. 6.00 am - Bird watching. 3.00 p.m. - Jungle walk. An excellent opportunity to see the wild animals, small mammals, birds and waits in the Tower to have the wild sightseeing, accompanied by our experienced naturalists and wild life tracker. Excellent photographic opportunities are plentiful. All Transportation during bardiya Natinal park pacakge destinations will be provided in a private vehicle. All accommodation in Bardiya National Park including all program activities, Elephent Safari, Jungle walk, Local village Sightseeing, accommodation at Camp resort, 3-meals per day and all park entry permits.